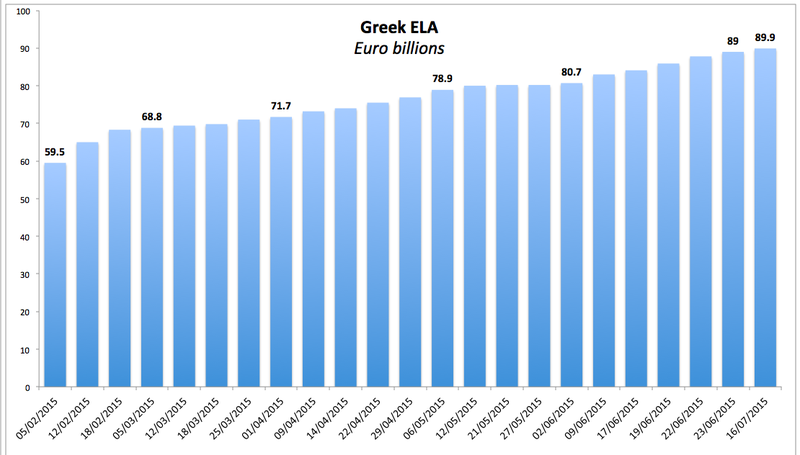 So ECB lifted Greek banks' ELA by EUR900mln to EUR89.9 billion today for the first time since June 23rd. This suggests that Mario Draghi and the team ECB have found a way, for now, to set aside all concerns about Greek banks solvency and extend the lifeline to Greek banks until at least the end of July. 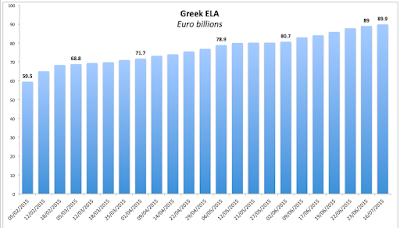 The lifeline, however is not sufficient to cover deposits withdrawals that would occur if the Greek government were to lift capital controls. Addressing the severity of ECB haircuts on Greek banks' collateral eligible for ELA. Here, the problem is severe: even before the mess with capital controls, Greek banks held poor cushion of eligible collateral. With capital controls, this cushion is even weaker as many households and companies have stopped funding their loans. The ECB will have to lower haircuts on collateral and/or broaden collateral pool - both moves would be hard to pass as it is now publicly apparent to all that Greek banks health is deteriorating rapidly.